All homes currently listed for sale in the zip code 91737 as of 04/22/2019 are shown below. You can change the search criteria at any time by pressing the 'Change Search' button below. 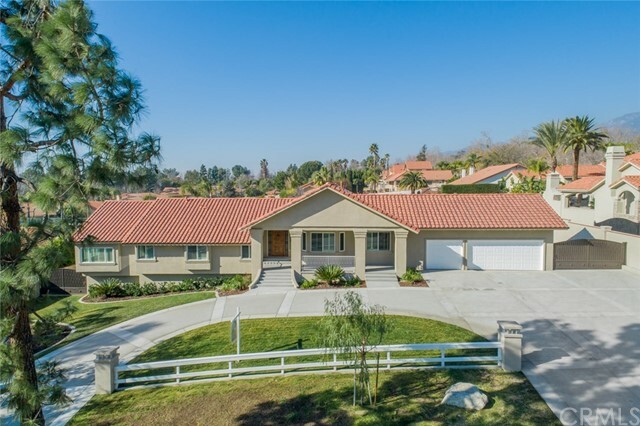 "This single-story home is a must-see if you're looking to reside on a premium corner lot of the Heritage Estates. This property features two 2-car garages, one on each side of the home, and RV parking for all your family's needs. This home has 3 bedrooms, 1 office, and 2.5 bathrooms. The master suite has a spa tub, shower, and a huge walk-in closet. When you enter the home, you will be greeted with a large living room that overlooks the lush backyard and pool. This home meets the perfect balance for providing comfort for your family and also entertaining guests." "BEAUTIFUL REMODELED DEER CREEK HOME! This is the DEER CREEK home you have been waiting for! Gorgeous 3 bedroom, 3 1/2 bathroom home featuring quality craftsmanship and numerous amenities and upgrades. Located in the top notch rated Los Osos High School district. 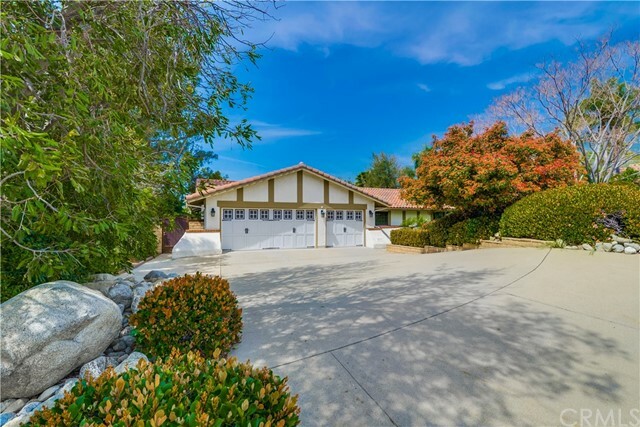 This highly desirable single story home offers 3294 square feet on a huge, 33,360 square foot lot, large enough to add an additional garage, RV Garage, pool, casita or tennis court. Featuring a formal entry open to the spacious formal dining room with oversized crown molding and ceramic/wood plank flooring. The Great Room with ceramic wood plank flooring is large enough for all your entertaining. The impressive gourmet kitchen has new stainless appliances, new quartz counter tops, new stainless steel sink, new raised panel cabinetry, and a walk in pantry. There are 3 bedrooms all with their own ensuite bathroom, and walk in cedar lined closet. All bathrooms are remodeled, including new cabinets, faucets, toilets, and showers. The air conditioner has been upgraded, as well as the ducting. This home also features a new roof, all new indoor and outside painting, including the block walls and new stucco on the outside of the house, new exposed aggregate concrete circular oversized driveway, new 14 foot RV gate, new indoor and outdoor lighting, new landscaping, new flooring, new ceiling can lighting, new windows, new interior doors including the front door, and new water heater. 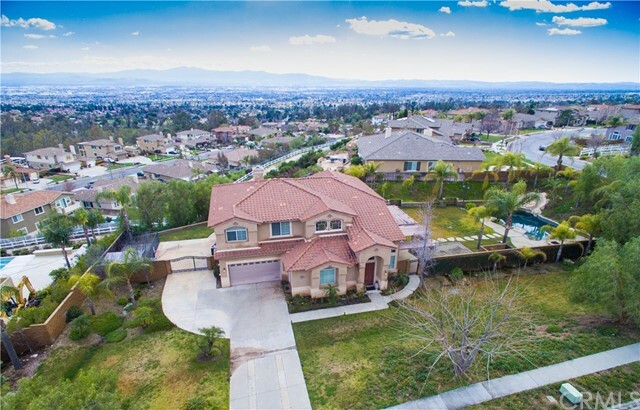 Don't miss out on this exceptional home!" 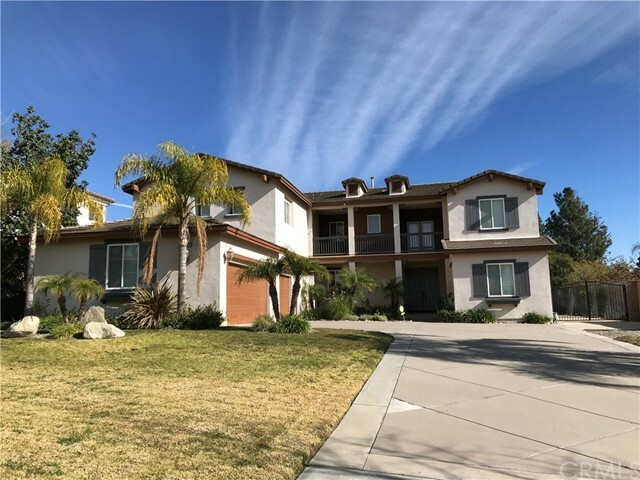 "Prestigious Executive Estate with over 4000 sq ft of living space situated on beautifully landscaped half acre lot features 5 bedrooms and 5 bathrooms, (5th bedroom/bath) is separate studio guest house with private entrance located off courtyard). Master bedroom includes fireplace with separate sitting area, double walk-in closets and spacious master bathroom. Additional features include bright and airy gourmet kitchen with walk in butler's pantry, solid hardwood floors, high ceilings, covered slate patio and 3 car garage with epoxy flooring. Front courtyard features cultured stone, gas fireplace and fountain. Front and backyard are fully landscaped. Expansive backyard features covered patio with slate floor, large wood burning fireplace with plenty of room for pool, if desired. 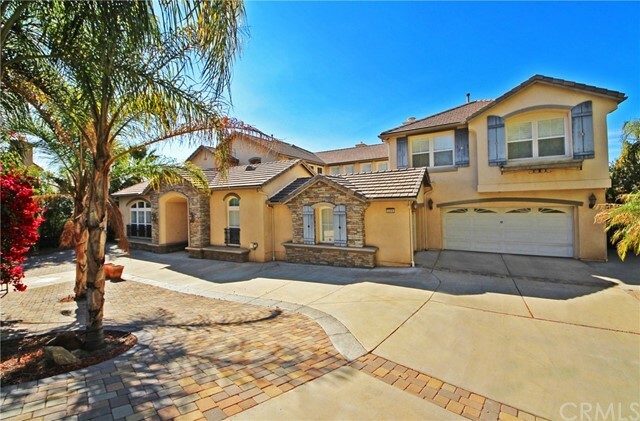 Centrally located near shopping, restaurants, Chaffey College and the 210 freeway. DO NOT MISS OUT ON THIS OPPORTUNITY TO OWN THIS EXQUISITE PROPERTY! Buyer s to investigate and verify square footage accuracy." 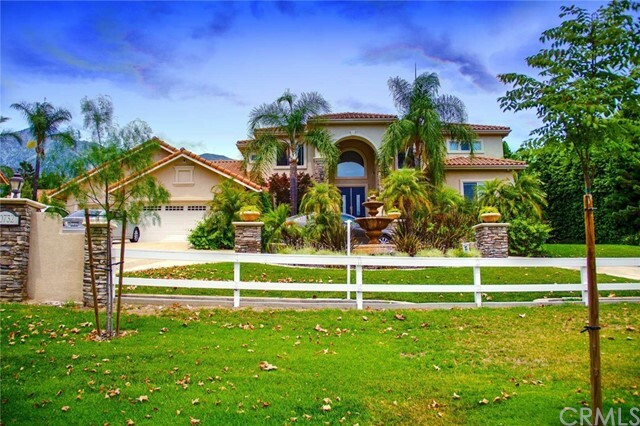 "*PRICE REDUCED 50K* Beautiful home, on 25,000sf (over 1/2 acre) lot. with breathtaking views. Spacious open floor plan with vaulted ceiling. Kitchen offers Granite counter top, large island and pantry. Main floor has office/guest with private bathroom. There is also a computer area next to laundry room. Spiraling stair case leads to a spacious loft. Master bedroom has dual sinks, shower, a separate jacuzzi bathtub and walk in closet. Elegant Crown Molding, Ceiling Fans, Plantation Shutter and Blinds. Cover Patio with fan. Swimming Pool, water fall/slide, Jacuzzi, Fire Pit that adds entertainment value. 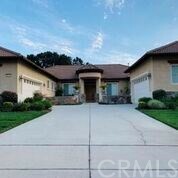 Extra long driveway, attached 3 car garage and RV/Boat Parking Area. The place has great potential! Property will be sold AS IS condition. No repairs will be done. All information is deemed reliable, but not guaranteed. Buyers and buyers' agent to complete all their due diligences." "Looking for an amazing place, here it is! This home is where the search can stop. This home brings all the aspects that are required to live comfortably. 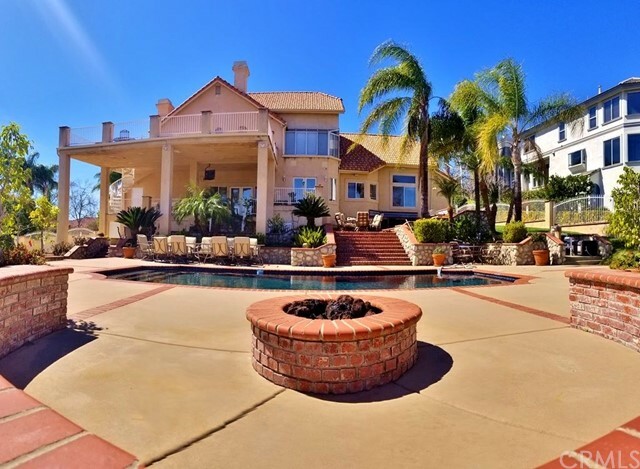 The property is stunning with a large pool, upgraded kitchen appliances, upgraded/remodeled cabinets and much more. This property have tile flooring including carpet in the rooms and stairs, and it has wood flooring. 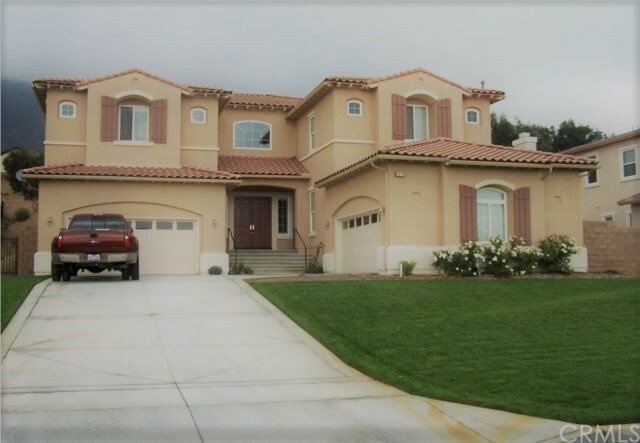 This home is a beautiful two story property that sits on top of a large lot that is 21,600SF. There is tile in the bathrooms, and the bathrooms are upgraded with dual sinks in the master bathroom. In the house, there has been intricate painting done in specific rooms that ties in the whole home's decor. Once in the backyard there is a patio cover with outside seating, the pool with the spa that stops where the property continues up the hillside. The lot has RV parking as well! A view from the back patio shows a great look at Mt. Baldy! Come take a look for yourself!" "CONTEMPORARY ELEGANCE IN DEER CREEK ESTATES! 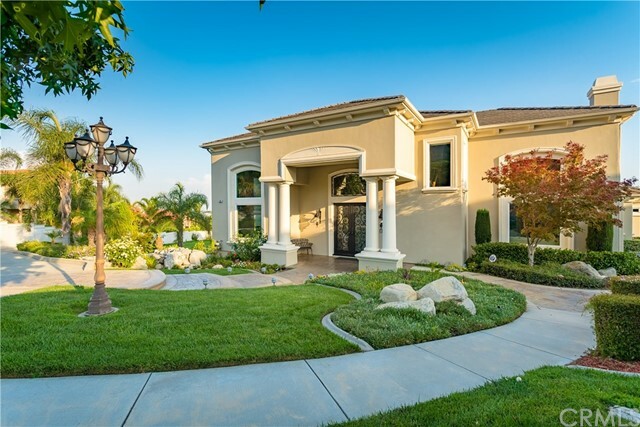 INVITING CURB APPEAL DRAWS YOU INTO A BREATHTAKING TWO-STORY FOYER FEATURING IRON & GLASS ENTRY DRS, 4 ITALIAN CHANDELIERS, DECORATIVE STONE WALLS & OPEN BEAMS. CUSTOM FLRING & DECORATIVE ACCENTS CONTINUE INTO THE FORMAL ACCOMMODATIONS W/CROWN MOLDING, WOOD ACCENT WALL, PLANTATION SHUTTERS & CUSTOM FIREPLACE. PRIVATELY SITUATED MASTER SUITE BOASTS CUSTOM W/I CLOSET, PRIVATE BALCONY & ONE-OF-KIND ENSUITE BATHROOM. SENSATIONAL TILED TUB & SHOWER AREA BOASTS JACUZZI TUB, PEBBLED FLOORING & MOEN RAINFALL SHOWER SYSTEM WITH 3 HEADS & AMAZON ECHO TECHNOLOGY. DUAL SINKS & VANITY FEATURE BEAUTIFUL GRANITE & RICH CABINETRY. THE REMODELED KITCHEN OFFERS OFF WHITE CABINETS, GRANITE COUNTERS & STAINLESS APPLIANCES INCLUDING B/I RANGE. THE OPEN FLOOR PLAN INCORPORATES A SPACIOUS FAMILY ROOM W/SURROUND SOUND & CORNER FIREPLACE, BREAKFAST NOOK & OUTDOOR ENTERTAINING AT ITS FINEST. EXPANSIVE PATIO AREA FEATURES CONCRETE BAR W/BUILT-BBQ, SINK, FRIDGE & STOVETOP, SURROUND SOUND, FIRE PIT & CITY LIGHTS VIEW. 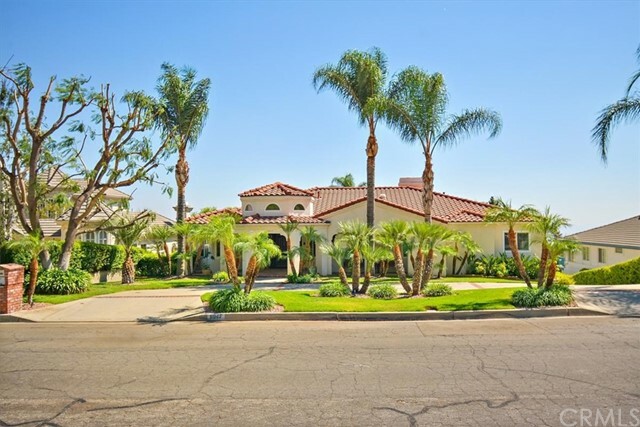 HOME OVERLOOKS LUSHLY LANDSCAPED YARD W/LAWN & SPARKLING POOL/SPA W/PEBBLETEC, AQUA LINK SYSTEM, BAJA STEP, WATER FEATURES. ADDITIONAL SEATING AREA W/FIREPIT & CUSTOM LAMP LIGHTING BECKONS. SECONDARY BEDRMS SHARE LARGE BATHRM W/DUAL SINKS & SEPARATE TUB & SHOWER. ADDITIONALLY, THE HOME FEATURES DUAL PANE WINDOWS, UPDATED HVAC, 3 CAR GARAGE W/EPOXY FLOOR, INDOOR LAUNDRY. (4TH BR IS CURRENTLY AN OFFICE) INFORMATION DEEMED RELIABLE, BUYER TO VERIFY." 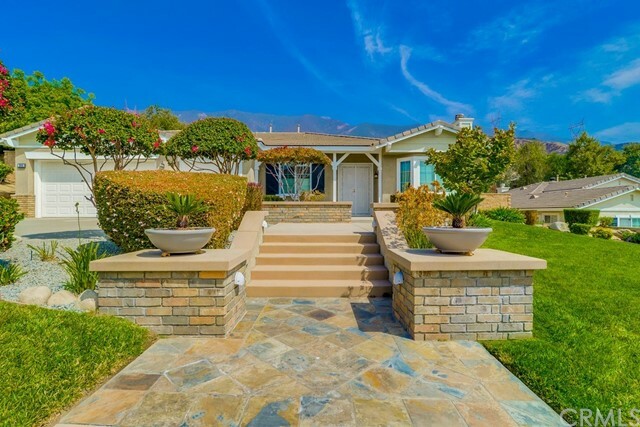 "Beautiful sought-after ALTA LOMA home is located on a cul de sac w/ a salt water pool & detached GUEST HOUSE built by Pruitt. Newer features include Infinity dual pane windows, solar tubes, sky light & many French doors leading to the backyard which make for a very light & bright flowing floor plan. The kitchen w/ eating area has been remodeled w/ stainless appliances; it opens to the family room & bonus room. Cozy up to 3 fireplaces, one in each of the following rooms: Living room, family room & master bedroom. Hardwood flooring & ceiling fans throughout. Spacious master suite with French doors. Individual laundry room just off the garage. The roof was replaced in 2014, 2 A/C units & furnace replaced in 2012 plus a Carrier unit in the Bonus Room. Separate single story Guest Home offers an open layout, large kitchen, granite counter tops, stainless appliances, single bedroom, bathroom w/ walk-in shower, and a washer & dryer. The Guest House overlooks the backyard & has French doors leading into the pool area. 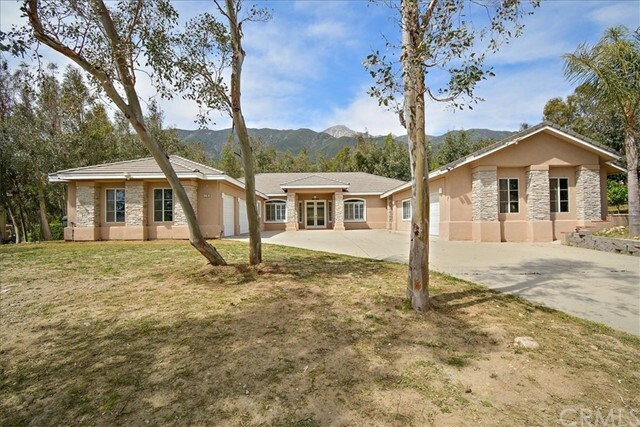 This home is positioned for privacy for your full enjoyment of the resort-like backyard & mountain view! Enjoy newer pool equipment in 2012, pool gates, an in-ground spa installed in 2014, waterfall added in 2014, 3 covered patios completed in 2014 & uncovered patio areas for entertaining. Three car finished garage w/ checkered epoxy flooring, carriage style garage doors & pull-down ladder for more overhead storage. Potential RV area & access to bridle trail." "Beautiful Single Story Home! Gracious floor plan with wide hallways, spacious rooms, and high ceilings. 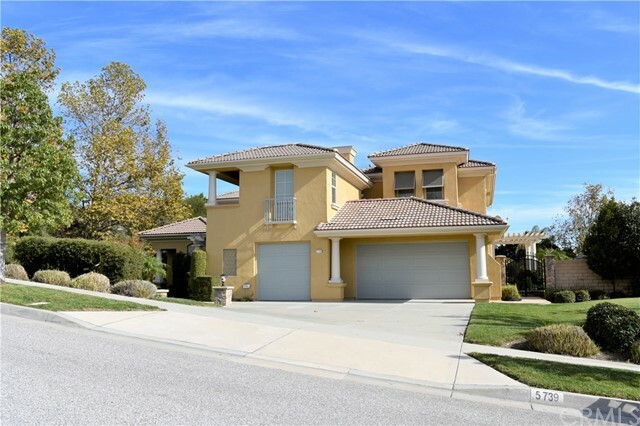 This elegant home has four bedrooms (1 currently being used as an office) and 2.5 Bathrooms. Lovely formal dining and living room with fireplace. Family room with fireplace and views of the beautiful backyard and mountains. This home is equipped with automated systems for lighting and sound system with speakers inside and out. 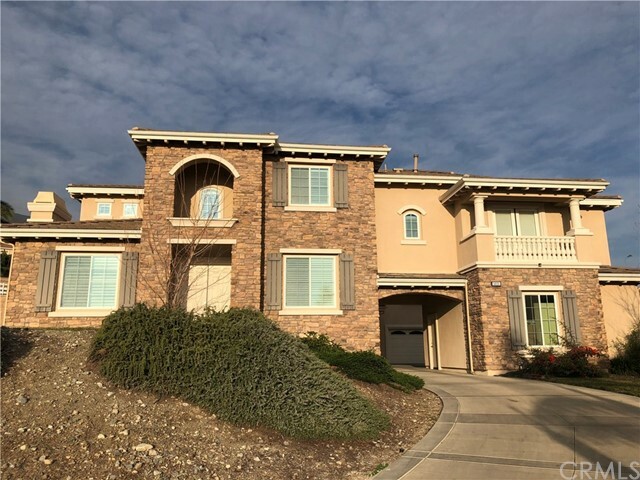 The backyard is terraced with lovely professional landscaping complete with drip irrigation system, gas fire pit, charming walkways, river rock dry beds, in-ground spa with a waterfall, pergola, covered patio, and beautiful plants and trees. The upper terrace of the property is ideal for horses with bridal trail access to the rear, or use it for garden or orchard. The three car attached garage has built in shelving. Top-Level Night Sky Views! Extensive Hardscape Front and Back, Backyard Tiered Patios, and Wonderful In-Ground Spa with Waterfall! A MUST SEE!!!!" "This Deer Creek beauty has had some recent upgrades, including granite kitchen counters new fixtures throughout. New counters in master bath, new low care wood look decking on multi level patio. Great floor plan with formal living dining room and large kitchen den area. Downstairs office/bedroom with full bathroom on the 1st floor. 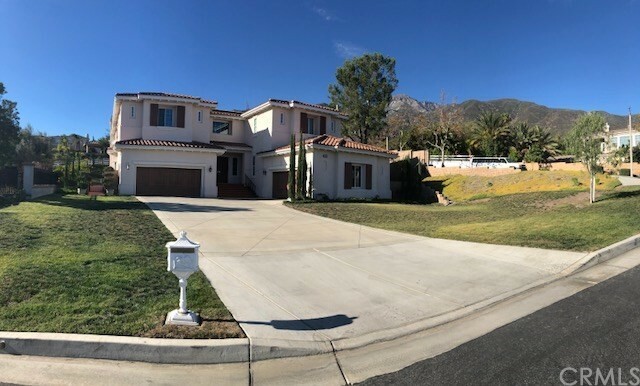 This house has a great back yard for those looking to entertain with rebuilt decks on different levels that feel like your at a resort in the mountains. Recently painted interior, wood shutters on windows. Pond with waterfall and bridge. Huge lot with room to roam. Tons of storage under the house. Master closet features a electric carousel that expands amount of hanging clothes that can be stored and easy to get to. Deer Creek features bridal paths and open space that makes for spacious living."